Considering that this is Country Music Week, you’d think some big-time stars would be shooting across the sky with new music. Instead, it’s the indie community that is bringing its A-game. Canadians Aaron Lines, Deric Ruttan and Charlie Major are all here with dandy, up-tempo tunes. Nashville’s own Kelly Lang & T.G. Sheppard are even better. 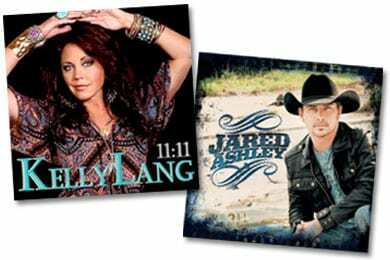 Drawn from Kelly’s new 11:11 CD, their powerful duet is the Disc of the Day. There are two promising newcomers to report to you. Barry Michael and Jared Ashley both bow in the column this week. Jared Ashley wins the DisCovery Award. Someone in Becky Harris’s office sent his CD to me, and I always like what Chris Young’s mom likes. —He sings with clarity and sincerity. Kimo’s production, as usual, is exemplary. The song is listenable and decent enough, but is hardly undeniable. Find a hit. —She keeps it together in public, but when she’s alone, she lets it all out. Katie is in peak form vocally on this range-y power ballad. Solid work. —Jared is a Georgia boy who has evidently garnered a good following in his home state. His disc debut features this moody mid-tempo outing. She feels like damaged goods, but he assures her that she is stained beautifully, like a church window. His performance is nicely shaded, varying from almost whispered passages to near shouts of passion. —Glen’s new video is for the title tune of his superb finale as a recording artist. Like his classic hits, the song has a soaring, catchy melody and an instantly memorable chorus embellished with sky-high strings and prominent guitar. Awesome stuff. Did I mention that I am a lifelong fan? —Julie’s new Alive CD concludes with this rousing stomper. Do I hear a national sports anthem, here? Heck, she even name-checks all the tracks. —The rest of the title is, or should be, “for Mom and Dad.” It’s a slo-o-o-w piano ballad about all the good advice she got from her parents. I nodded off. —Considering the cancer battle Kelly and husband T.G. have been through, the title is a little unnerving. But the lyric is about romantic abandonment, not her physical condition. Kelly’s melody for it is absolutely sumptuous, and both of them sing the fire out of this swirling, fevered festival of emotion. Hang on for the bridge, when the production really starts to build. Heart gripping. —Charlie is a big star in Canada. I don’t see any reason why this friendly, upbeat, good-advice rocker couldn’t translate to audiences south of the border. —Aaron returns with this smile-a-minute, romantic bopper performed with hearty positivity. I like his slips up into falsetto notes on the choruses and urgent breathiness in the verses. Loaded with hooks. —Ruttan is a successful Music Row songwriter who dips his toes into the artists’ pond once again with this well-produced romper. I like the thumping percussion and the guitar riffs. His voice isn’t all that memorable, but he sells this just fine.